Mitch Moody, the Pitmaster at Anderson’s Bakery, Catering, and BBQ in Kathleen, Georgia shared his Wednesday Wing Deal recipe. 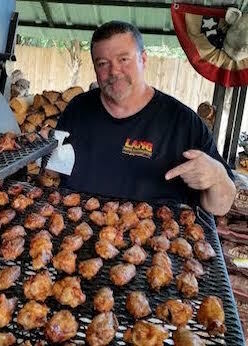 We love this photo of Mitch on a typical Wednesday (Wed Wing Deal), cooking 300 to 500 jumbo wings cooking on one of his Lang BBQ Smokers and proudly wearing his Lang t-shirt. I smoke the chicken wings on one of my Lang BBQ Smoker cookers for 2 hours 15 minutes at 250° with pecan and hickory wood for fuel. When I remove them from the smoker cooker, I glaze the wings with Sriracha and honey. These chicken wings are sweet, spicy, salty, and smokey! Place the wings on a Lang BBQ Smoker at 250 degrees for 2 hours and 15 minutes. When you take the wings off the smoker cooker, brush the GLAZE on. …more about Pitmaster Mitch Moody on Who’s Cooking on a Lang? This entry was posted in Chicken, Poultry and tagged Mitch Moody, smoked chicken wings by . Bookmark the permalink.